This 8 inches tall flower basket is covered in rich, chocolate brown satin and decorated with two brown satin bows. Measuring 7 inches tall, this elegant flower basket is covered in off-white satin and accented with satin bows. Also available in taupe and white. Those couples looking for a simple flower basket design to match their decor should look no further than this 7 inches tall satin round basket, with a lovely bow at the base of each handle. Also available in white. Those couples looking for a simple flower basket design to match their decor should look no further than this 7 inches tall satin round basket, with a lovely bow at the base of each handle. Also available in ivory. 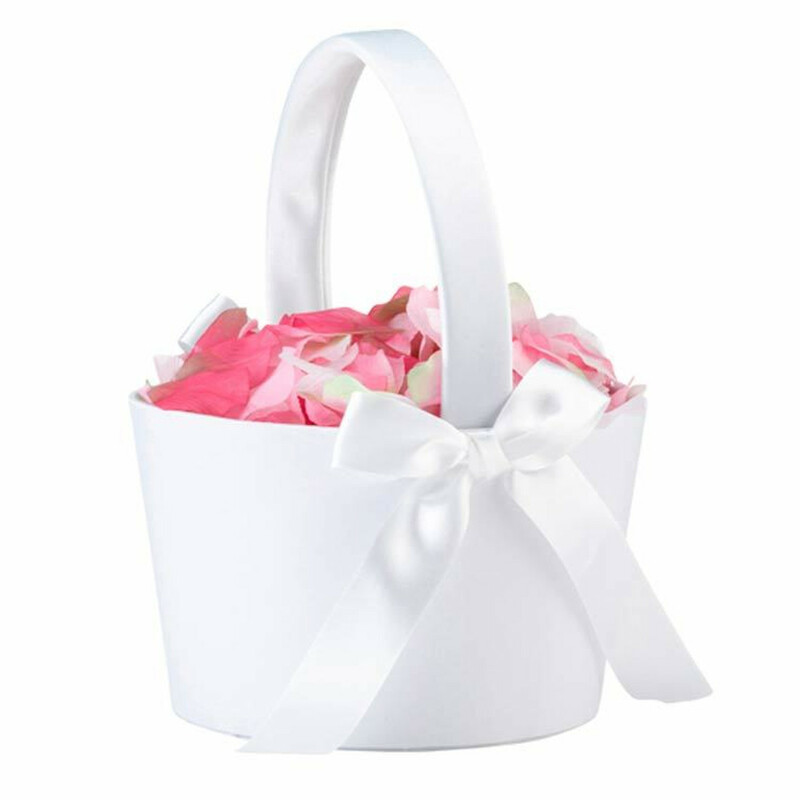 Measuring 7 inches tall, this elegant flower basket is covered in white satin and accented with satin bows. Also available in off-white and taupe. This simple ivory satin flower basket stands 8. 5 inches tall. The handles are made of a lovely series of beads. Also available in white. Standing 8. 5 inches tall, this white satin flower basket has been embroidered with a lovely leaf and vine pattern. The handles are made of a chain of white beads. Also available in ivory. Natural beauty will blossom from this 8 inches moss covered flower basket. Carry your woodland theme throughout the wedding ceremony with this birch flower girl basket. Its square shape and rustic look make this a must-have ceremony accessory. It measures 9. 5 inches. Covered in cream-coloured satin, this flower basket is wrapped in a brown satin sash knotted in the center. Size: 7 inches tall. The front side of this white satin flower basket is decorated with a black satin ribbon, bow and rhinestone ornament. Below the ribbon is a silk-screened black damask pattern. Size: 7 inches tall. This ivory satin flower basket is decorated on the front side with ivory ribbon, an ivory bow and a rhinestone pearl ornament. The design is completed with a series of scattered pearls on the front. Size: 7.25 inches tall. Measuring 9. 5 inches tall and 6.5 inches wide, the ruffled look and unique shape make this basket an attractive wedding accessory. The ivory satin is accented by two large ivory satin bows. Also available in white. This ivory satin flower basket is accented with an ivory satin sash wrapped and knotted around the rim. Size: 7.75 inches tall. Also available in black and red. This charming white satin flower basket is silk-screened with artwork on the front side depicting a pair of love birds on a tree branch. Size: 7.5 inches tall. This white satin flower basket is accented with a white satin sash wrapped and knotted around the rim. Size: 7.75 inches tall. This charming 10 inches flower girl basket is covered in cream satin. Its simple style and two satin bows make this classic flower girl basket an ideal wedding ceremony accessory for flower petals or wedding programs. This charming 10 inches flower girl basket is covered in white satin. Its simple style and two satin bows make this classic flower girl basket an ideal wedding ceremony accessory for flower petals or wedding programs. This 7 inches tall flower basket is covered in rich, plum-coloured satin material. The sides of the basket are accented by plum satin bows. This taupe satin flower basket is decorated on the front with darker taupe ribbon and a light taupe rose. Size: 7.75 inches tall. Also available in white. Measuring 8 inches tall, this cream satin flower basket has a stylish pleated look. A pleated satin sash decorates the upper part of the basket, and a cream satin rose with clear beads decorates each end of the handle.